Before we can calculate the amount of salts we need to add to hit our mineral targets, we also need to know how much strike and sparge water we will be using. For a more detailed explanation of strike and sparge water, see our Brew Day Step by Step guide. We now have all the numbers we need to calculate the salt amounts required to hit our mineral targets. There are many tools available to perform these calculations. We like to use the free spreadsheet EZWaterCalculator as it's one of the most intuitive and easy to use tools we have come across. Download EZWaterCalculator and enter your values into the Step 1 areas highlighted in yellow below. This is your starting water profile information (Ca, Mg, Na, Cl, and SO4) along with your strike/sparge water amounts. If blending with RO or distilled water, enter the percentage used and the spreadsheet will automatically adjust your resulting water profile numbers for you when performing calculations in later steps. Leave the Bicarbonate/Alkalinity value blank. Our starting water profile and water amounts entered into Step 1 of EZWaterCalculator. Steps 2 and 3 of EZWaterCalculator attempt to estimate your residual alkalinity (RA) and mash pH based on the grain used, the starting alkalinity of your water, and acids that you may add. We recommend skipping over these directly to Step 4. We don't care about the RA (more information below) and pH estimators are notoriously inaccurate due to the complexity of the calculations and the number of variables involved. Instead, we will later use a pH meter to take actual pH measurements and adjust if required. The mash is only one of many places where pH is important, so a pH meter is a handy tool to have. 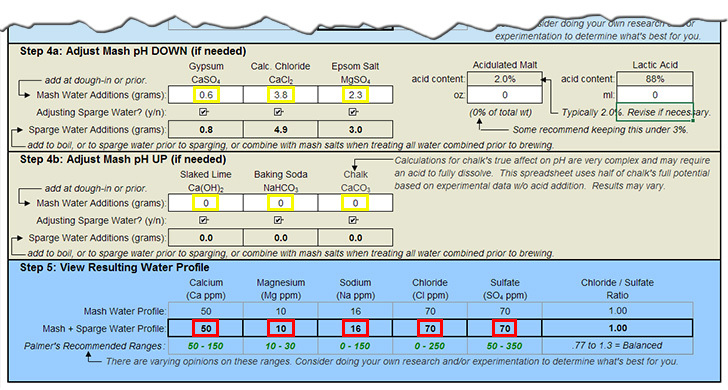 In Steps 4a and 4b of EZWaterCalculator adjust the amounts of Gypsum, Calcium Chloride, Epsom Salt, Chalk, and Baking Soda on the two 'Mash Water Additions' lines (shown in yellow below) until the 'Mash + Sparge Water Profile' line in Step 5 (shown in red below) matches or is close to the desired mineral targets. Most of the time we only add Gypsum, Calcium Chloride, and Epsom Salt (the top 3 salts in Step 4a which adjust mash pH down). We recommend starting with these three. Start by increasing Epsom Salt until the Magnesium target of 10 is reached, then increase Calcium Chloride until the Chloride level of 70 is reached, followed by increasing Gypsum until the Sulphate level of 70 is reached. Keeping Sodium very low in most beers is the goal. Our water starts with a Sodium level of 16 and for the most part we leave it there for most beers as lower amounts of Sodium produces a cleaner flavour. If you are starting with a Sodium level that is lower, feel free to add some Baking Soda to raise the level slightly to match our recommended targets but do not feel it is required. If our starting Sodium was at 5 or 10, we'd probably leave it at that. If your Sodium is much higher than 30 however you may want to consider diluting with RO or distilled water. If you cannot hit the targets exactly, do not fret. The numbers are not absolutes. Keep in mind the original goal of the profile you are targeting. In this case the goal of this 'Balanced' profile is to "Hit minimums on Ca and Mg, keep the Cl:SO4 ratio low and equal". This means we prefer to reach 50 for Calcium and 10 for Magnesium, but a Calcium at 60 or even 70 is fine, as is Magnesium at 12 or 15. Keeping Chloride and Sulphate low and equal means that both at 50, 60, or even 80 is fine. Do not adjust the 'Sparge Water Additions' amounts directly. Instead, ensure that all six of the 'Adjusting Sparge Water?' checkboxes are checked and the spreadsheet will automatically calculate the 'Sparge Water Additions' amounts for you. What about alkalinity / residual alkalinity? I read that it was really important in brewing! The short answer: Ignore it. While it's important, we don't deal with it directly when adjusting water to target specific flavour profiles. The long answer: Alkalinity refers to how effectively water is able to resist a change in pH, in other words, how well it is able to to neutralize or 'buffer' acids before the pH changes. The higher the alkalinity or 'buffering capacity' of the water, the more acids or salts we need to add to lower the pH in order to achieve a proper mash pH. Most city water has a pH of 7.0 or higher but the pH range we want for our mash and finished beer is considerably lower. Hard water (water full of minerals such as Ca and Mg) is highly alkaline. In brewing, 'residual alkalinity' (RA) is actually what we care about (indirectly) as adding grain and salts will already lower the alkalinity and the buffering power we're left with is called the 'residual' alkalinity. Some books and articles will insist that RA is the most important water parameter when it comes to brewing. They will tell you to target a specific RA for the colour of beer you want to produce. The usual recommendation is that a low RA is best for lighter coloured beers, and higher is better for darker beers. The calculations are complicated and often calculators or nomographs (a type of fancy 2D diagram) are provided. Worrying about RA however is backwards, as RA is not something we target. What matters are the salts (for adjusting the flavour) and the mash pH (for proper starch to sugar conversion). If we do not achieve a proper mash pH after we've added our flavour salts, we simply add some acid to lower the mash pH into the proper range (more on this in a later step). The amount of acid required is usually minimal as we know the water cannot have been highly alkaline (hard), as otherwise we would have not have been able to hit our mineral targets in the first place as some of our starting water mineral levels would have been very high. Highly alkaline water is full of minerals and usually needs to be cut with RO or distilled water first in order to hit our mineral targets before we even begin to worry about mash pH. What about the pH of the water? Isn't that important? No. Ignore the pH of your starting water. How the water reacts to the various grains, acids, and salts we add is what matters. The goal is to achieve a mash pH that helps convert the starches to sugars. How easily your water's pH drops as you add the various grains, acids and so forth is a function of the residual alkalinity (see previous question), not the starting pH. In a later step we'll be adding acid to the mash if the pH is too high.